The time-lapse video of an incense burning was inspired by the history of Hong Kong as the “Fragrant Harbor” based on its large production of incense from locally grown sandalwood. (“Hong” means fragrant in the local Cantonese dialect and “Kong” means harbor.) For this project, Tsai sourced a large piece of incense from a local store on Queen’s Road West, an area in Hong Kong known for its sales of objects for religious and ceremonial offerings, and wrote the Heart Sutra in Chinese calligraphy on it. 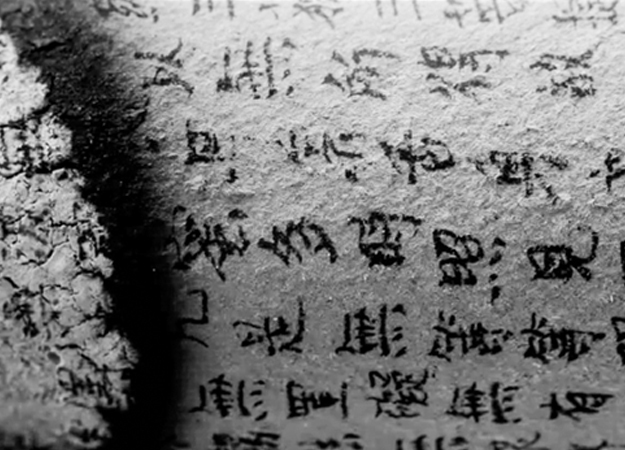 The sutra is a Buddhist text that Tsai has memorized as a child and is a seminal text on the concept of impermanence. She then lit the incense on a mirror reflecting the sky as an offering to the city. The work encourages a moment of contemplation on the spiritual significance of the sacred text while the physical form of the text transforms into ashes and smoke revealing the backdrop of the city’s celebrated skyline. Through the opportunity of working within a local context in Hong Kong, Tsai expands on her exploration of making works of art as objects of meditation and tools for spiritual and social practice.